A vital player ends an accumulation of speculation, by signing a new contract. The Reds march on, still in the race and keeping pace in second place. Club negotiator shows his nous, with a deal that keeps the big fish out. The Good, The Bad and The Ugly, another week at the world’s favourite football club, Liverpool FC. Making relatively easy work of a tough away fixture at Watford on Saturday. Vicarage Road has not been the happiest of places for Liverpool and what a difference a year, and a few quality signings makes. Liverpool came away with a tough 0-3 victory. At the ground where the same fixture last season we saw the visitors struggle to keep up with their hosts. The final score of 3-3 summed up a game that culminated in the Reds surrendering their lead in the closing minute of the game. No such drama this time around. Jürgen Klopp’s side went one better than their last Premier League outing putting three past Javi Garcia’s stubborn and organised team. The score line may arguably have flattered Liverpool in an encounter that saw ‘keeper Alisson come to the rescue with a couple of world class saves. 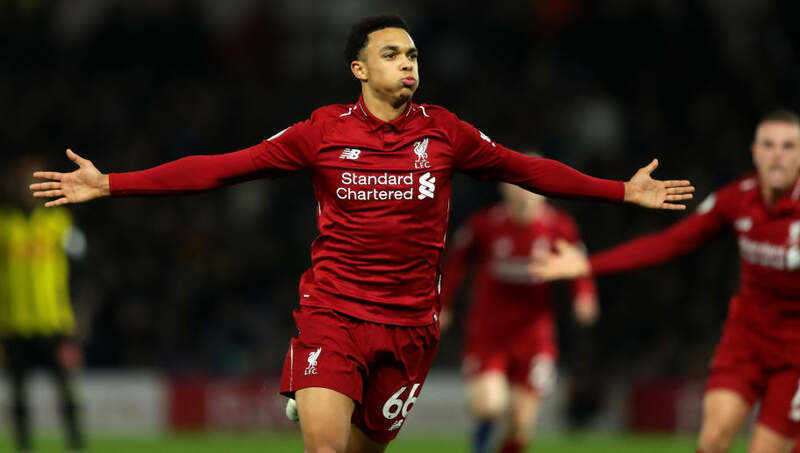 However, goals from Mo Salah, a peach of a free kick from Trent Alexander-Arnold and a late header from Roberto Firmino put the game beyond their hosts. Liverpool’s quality shone through in a performance that can best be described as “Professional”, to coin a phrase. To coin another phrase, a win is a win and I’d take that any day of the week. To be fair, Liverpool were lucky to avoid conceding a penalty when Andy Robertson (admittedly) fouled Will Hughes in the visitors goal area with the game still at 0-0. As things stand, the Reds maintain the chase at the top of the Barclays Premier League, to keep the deficit on leaders Manchester Citeh to two points. More in keeping with the late Michael Jackson’s interpretation of “Bad” this week. Sadio Mané putting pen to paper on a contract extension is worthy news indeed. The club hasn’t been able to convince the 26-year-old to get rid of the blond “go-faster-stripe” in his hair, but the contract signing, we must all accept is a suitable compromise. 📝 Sadio Mane signs a new 5-year-contract for @LFC. Since joining the Reds from feeder club Southampton in the summer of 2016, the Senegalese striker has registered 40 goals in 89 appearances. That’s 0.45 goals per game for those of you fond of anoraks. In my opinion, this is a major coup for Liverpool who, in recent years have lost the likes of Phillip Coutinho and Luis Suarez to Spanish giants Barcelona. Therefore, this pledge from the No. 10 means a great deal. He clearly feels the club can win trophies. Liverpool are clearly making progress off the pitch as well as on it. The Reds struck an extraordinary deal with Barcelona as part of the transfer of Coutinho to Barcelona. According to reports, the agreement states that should Barcelona wish to buy any other player from Liverpool for a period of three years (obviously now two), The Spanish club will have to pay an extra £89m (or €100m being the probable amount and currency discussed) on top of any transfer fee. Credit goes in large part to the club’s Sporting Director Michael Edwards, who was responsible for negotiating the eye-watering transfer. This is great news for Liverpool for two reasons. Obviously it means that Barca will have to think (very) carefully about making a bid for one of the club’s players in the near future. Secondly, it demonstrates the club is playing hardball with those clubs looking to take the p&€s, and their best players. Next up, we have a lively week ahead. A midweek trip to gay Paris for the Champions League Group C match day five. That’ll be a lovely affair. And as if that wasn’t enough, the real noisy neighbours from across Stanley Park come to visit on Sunday. Enjoy! Next articleIs it time to take a more balanced approach to Jordan Henderson?